Media Services/Classroom Support is a subgroup of Instructional Technology. Our main mission is to develop, implement and support multimedia presentation systems for classrooms. In addition, we assist with planning and development of technology needs for a wide variety of campus events. We also offer training and assistance with video duplication and format conversion. The main office is located on the second floor of the Stetson-Sawyer building in the CET. Media Services/Classroom Support provides presentation facilities and support for academic work and extra-curricular events. Support for lectures and presentations by faculty and guest speakers. Video and audio format conversion and copying. 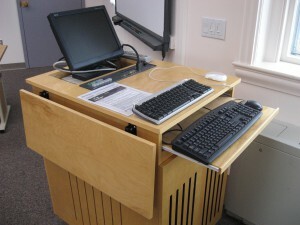 Installation & maintenance of electronic classrooms and major presentation venues. Training and guidance in using audio recorders and video cameras. We are now located on level 2 of the new OIT Center for Educational Technology (CET) in Sawyer Library. 8 AM – 7 PM, Mondays – Thursdays. 8 AM – 5 PM, Fridays. The Office for Information Technology (OIT) is available during the semester from 8 AM to 8 PM, Monday through Thursday, and 8 AM to 5 PM on Fridays. Normal hours outside of the semester are 8-5, M-F. Dial 413-597-2112 if you have any questions.